The weather's warming up, and with glimpses of the sun between showers, spring is starting to make itself felt. Plants waking up, new leaves appearing, new shoots peeping above the soil. My Fritillaries are in bloom, it's the first time I have grown them in the garden and I'm feeling ridiculously pleased. All this promises plenty to paint in the coming year, and the added excitement of field sketching. Last year, as part of the SBA Botanical Painting Diploma, I had to take to the field - literally - and record all the plants in a chosen area, then paint them as field studies. Finally, a selection were composed as a finished piece. This brought some interesting problems. A local marsh produced lovely plants that I'd never seen growing locally before, so it was an exciting expedition. But deciding what to take, and how to carry it, wasn't without problems. I decided on a minimalist approach. 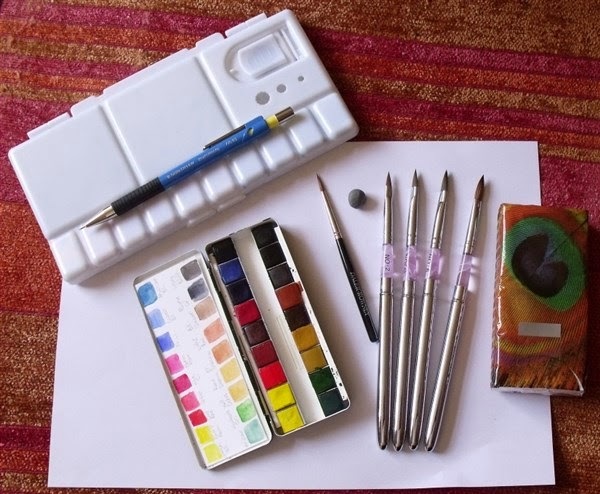 I already had a lovely mini watercolour box from Daler Rowney, with a tiny Sable brush, but knew more would be needed. I wanted Sable, but didn't want to carry expensive brushes, only to find I'd mislaid or dropped them in the field, with no hope of ever finding them again. After much searching online, I found a set of four Sable Nail Art brushes at a price that made me think they probably weren't real sable, but they had such good reviews, I sent for them anyway. The brushes were a nice surprise. 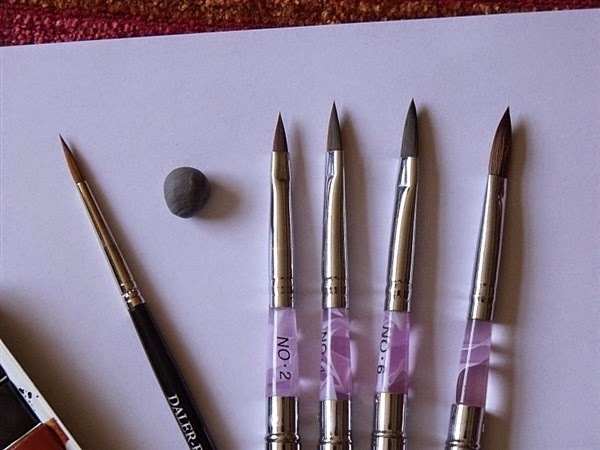 They handle really well, pointed Filberts, they're useful as wash brushes and detail brushes. They are pocket brushes, the handles doubling up as a cover to protect the hair in transit. One alteration was needed, a small hole drilled in the end of the handle/cover, to allow moisture to evaporate. A small folding plastic palette, propelling pencil, dividers, plastic 6" rule, wodge of putty eraser, a remarkably cheap 130gsm A4 sketch book, packet of tissues, a plastic cup, and two bottles of water completed my kit. I should have taken my official sketchbook, but it was becoming unwieldy to carry and impossible to use without a table. Two bottles of water, because I was working in 90f and no shade. I should have had a large straw hat, but couldn't find one. All this went into a canvas satchel, but rattled round in the bottom, so I'm currently searching for a watercolour sketch bag to keep everything together. The satchel was a real find. Light to carry, but large enough to hold the inflated plastic bags holding a wet cotton pad and any collected specimens. I just need replace the London Olympics picture from the front flap with one of my own, that should be fun.